Finding Storage space on the floor for sports equipment is no easy task. However, there is often a great deal of free space at the ceiling which can be utilised with the assistance of our storage hoists. 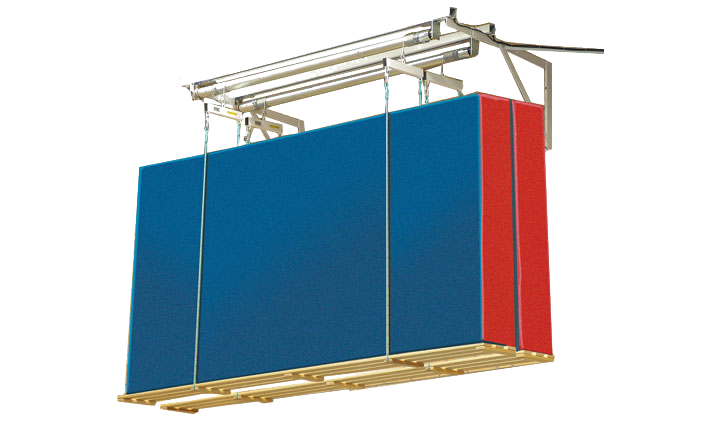 The hoists satisfy the applicable legislation and are CE marked. We prioritise safety - which is why all of our hoists come with extra motor protection, carbine hooks with screw locks, reinforced wall brackets and safety-rated cable as standard. White (RAL 9016) varnished yoke. Hoist platform made of varnished pine boards. Available in 2 models: "Double" and "Single". Can be wall-mounted or ceiling-mounted. Suitable for mats up to 4000mm x 2000mm x 400mm with a maximum total weight of 75kg with standard motor. As above, but with a strap instead of a timber cradle to allow goals to be attached and hoisted to high level. 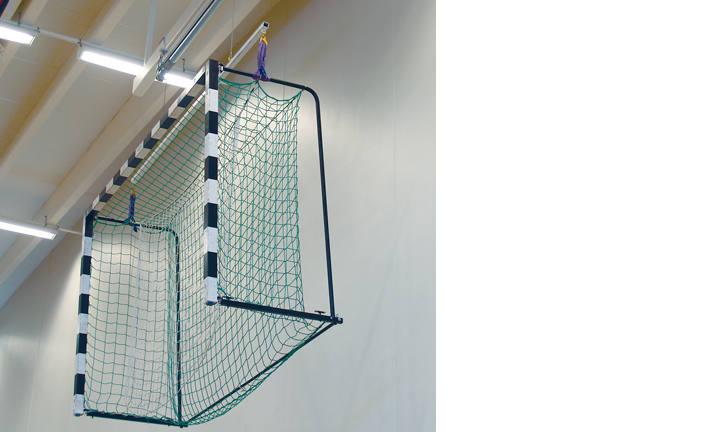 Ideal for items such as Handball Goals, small-sided Football Goals, etc.